We love this property. We have 3 little kids under 5 and love this property. Great pool, park, beach, restaurants, activities, and character dining ecperience. Also boat and bus service to Disney is excellent. And the fact that you can walk to the boardwalk and other hotels like Disney beach and yacht club is awesome. The parking was horrible. It seems like they booked a bunch of events and they didn't realize they don't have enough parking. We had to park on a grassy area over a sidewalk. $11 for a grilled cheese sandwich?!?! Really?!?! Needs more kid friendly options on all the menus at all the restaurants. I loved the views from the room. The pools were huge and not crowded. I hated how the rooms didn’t have microwaves. I also hated the very slow drains in the sink and bathtub. Those are my pet peeves. Lots of pool areas. Easy walk or boat ride to the Boardwalk. Easy access to Epcot and Disney Hollywood studios by boat. Good variety of restaurants. This hotel was spotless! New carpeting in the room. Restaurant open 24 hours. Speedy valet. When requesting room with a view of the fireworks, it would be good if you didn't place us at the opposite side of the hotel. But we enjoyed everything else. We really appreciated the valet parking, staff, and allowing us to keep our car there after checking out while we visited Epcot. Having a place to keep our luggage safe with friendly staff was also wonderful. Thank you very much. We would stay there again. In general the hotel is pretty and very conveniently located. The playground was way too dark they should turn on the lights. The food is expensive but it’s tasty. Located in Bay Lake within a short walk of Disney's Boardwalk, Walt Disney World Dolphin is within a mile (2 km) of other popular sights such as Disney's Hollywood Studios®. This 4-star resort welcomes business and leisure travelers with 5 outdoor pools, a private beach, and a full-service spa. Enjoy dining at Shulas Steakhouse, one of 12 onsite restaurants. Savor a meal from the comfort of your room with 24-hour room service, or get a quick energy boost at the 2 coffee shops/cafés. Start each morning with buffet breakfast, available for a fee from 6:00 AM to noon. Guests can enjoy a flat-screen TV and stay connected with WiFi. Pillowtop beds sport premium bedding and the bathroom offers a hair dryer and free toiletries. Other standard amenities include a refrigerator, a coffee maker, and free newspapers. 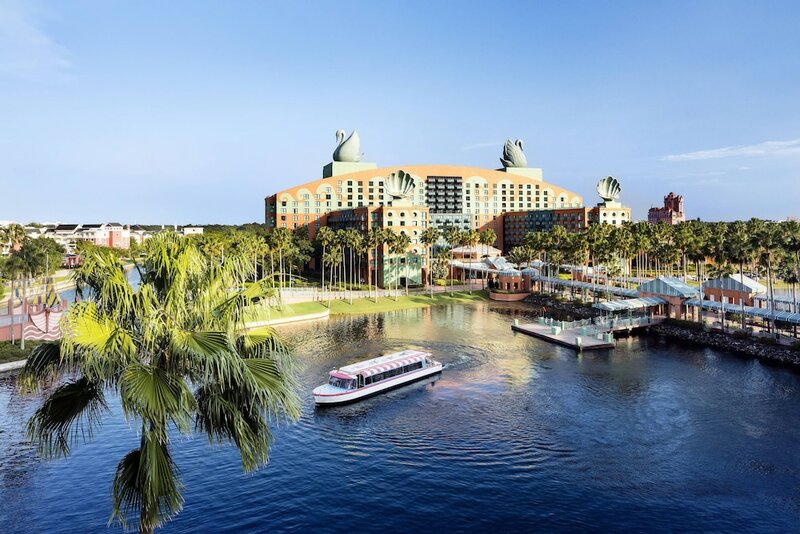 Walt Disney World Dolphin features a private beach, a full-service spa, and 5 outdoor pools. Parking is available for USD 25 per night (USD 35 per night for valet parking), and there's also limo/town car service. Multilingual staff at the front desk are standing by 24/7 to help with dry cleaning/laundry, concierge services, and luggage storage. Other amenities at this beach resort include a children's pool, a 24-hour health club, and a spa tub. Buffet breakfast is served daily from 6:00 AM to noon for a fee. Shulas Steakhouse - Restaurant and bar serving dinner. Todd English bluezoo - Seafood restaurant and bar specializing in seafood and serving dinner. Fresh Mediterranean Mrkt. - Restaurant and bar serving breakfast and lunch. Kid's menu available. The Fountain - Restaurant serving lunch and dinner. Kid's menu available. Picabu - Restaurant serving breakfast, lunch, and dinner. Open 24 hours. Walt Disney World Dolphin features a private beach and a 24-hour health club. The resort has 5 outdoor swimming pools and a children's pool. A waterslide, a spa tub, and a steam room are other recreation options.